The spring bedding crop season is over, so now’s the time to reflect on what worked, and what didn’t, for foxglove aphid control. This way we can prepare for their re-appearance in the fall. Foxglove aphid feeding on pansy. Note the characteristic dark-green blotches on the abdomen, and the dark joints of both the legs and antennae. Photo by S. Jandricic, OMAFRA. To recap, foxglove aphid (Aulacorthum solani) is a “cool weather pest”. It prefers temperatures between 15-25 C, and can’t survive in the greenhouse in summer (1). 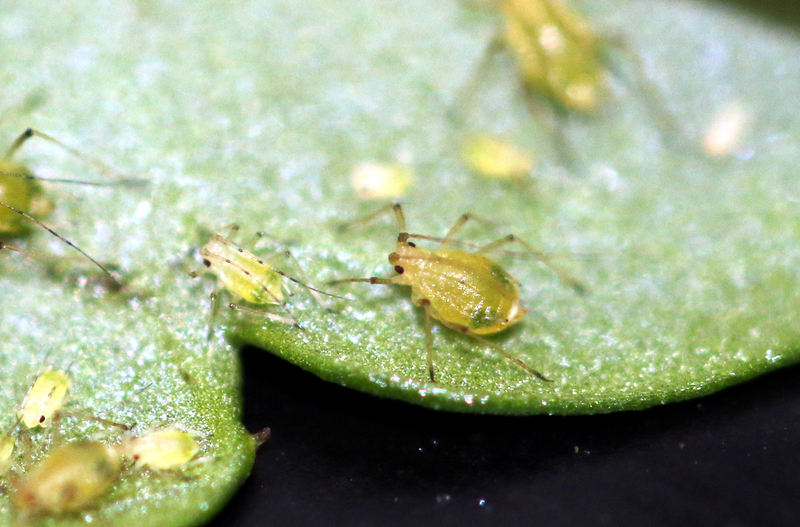 Unlike other aphid pests, foxglove aphid tends to feed in hidden locations – primarily the lowest leaves of plants – making it difficult to detect and treat. And, unlike green peach and melon aphid, biological control of foxglove aphid is definitely a challenge. Some growers and consultants have been trying both Aphidius ervi and Aphidius matricariae for foxglove aphid. But, as demonstrated by the Buitenhuis Lab here at Vineland, foxglove aphid is a terrible host for A. matricariae, and this wasp will barely parasitize it (see graph). Further, using A. matricariae for foxglove aphid can actually end up spreading this pest, and it’s damage (2). This is because the wasps simply pesters the aphids to the point where they drop of the plant and go find a quieter place to eat. So it’s pretty clear that releasing A. matricariae is simply a waste of money and effort if you’ve got foxglove aphid. Parasitism rates of foxglove aphid by different Aphidius species. Wasps were offered 50-60 2nd instar aphids. Tests were done in small plastic containers. But what about A. ervi? Although parasitism rates were high in the lab (73%), results were not as good in practice. Tested in the greenhouse, A. ervi was able to offer about 50% control of foxglove aphid after 1 release. Repeated releases may offer greater control, but this is still not reassuring when you’re talking about a pest where populations can explode quickly. Why A. ervi does a great job of parasitizing foxglove aphid the lab, but not the greenhouse, is something we’re currently investigating. But until we have an answer, it seems that pesticides may currently be the best option for control of foxglove aphid in floriculture IPM programs. With the current limitations on neonicotinoids, growers will want to turn to Beleaf or Endeavor. (But, since these two chemicals have similar modes of action, and it usually takes several sprays of either to provide complete control, you may want to consider rotating these chemicals with Enstar II to prevent resistance). If you’ve had infestations of foxglove aphid in your greenhouse, and have anything to say about it’s control, feel free to leave me a comment! (1) S.E. Jandricic, S.P. Wraight, K.C. Bennett, and J.P. Sanderson. 2010. Developmental times and life table statistics for the aphid Aulacorthum solani (Hemiptera: Aphididae) at six constant temperatures, with recommendations on the application of temperature-dependent development models. Environmental Entomology 39(5): 1631-1642. (2) L. M. Henry, J.A. Bannerman, D.R. Gillespie2, and B.D. Roitberg. 2010. Predator identity and the nature and strength of food web interactions. Journal of Animal Ecology doi: 10.1111/j.1365-2656.2010.01723.x.